Three Denbigh Harriers took part in the Aber Bach Fell Race on Tuesday night. This is a 4.1 mile race which climbs over 1000ft in the first two miles followed by a very fast descent. Vic Belshaw was first Harrier home, finishing in a very respectable 21st position out of 139 runners in 31 minutes 47 seconds, first M5O, breaking the M5O record. Next Harrier to finish in 65th position in an excellent time of 37:01 was Katy Baugh. 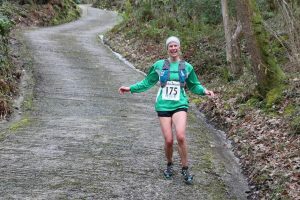 Finishing in 90th position, first F60 and breaking the F60 record, set by herself last year, by over 3 minutes, was Menai Baugh in a time of 40:49. Dawn Marshall was the sole Harrier at Chester Spring 5 this week. It was lovely evening run on the 5 mile course round the leafy traffic-free lanes. Dawn was pleased with 45:58 and a race PB by 1:49. She was 346th out of 526 and 94th female out of 206. Duncan Jones finished in 1.20.34 for the Goldrush Trail at the very scenic Coed Y Brenin on Saturday. This hilly course of over 8 5 miles was a good challenge in perfect sunny and dry conditions. The first running of the Llangollen Fell Race took place on Sunday. 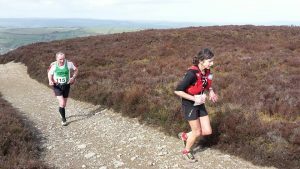 Katy Baugh was the sole Denbigh Harrier in this very challenging race of 17.13 miles with 2,818ft of ascent. Katy finished in 57th place in 2.55.23 and was 10th Female. The Coast Half Marathon was billed as a fast flat course but with a headwind the whole way this course ended up being more challenging than first anticipated. Ten Denbigh Harriers took part. Despite the headwind there were personal bests for Dan and Mat Jones. There were strong runs from David and Ian Jones to get under the two hour mark. 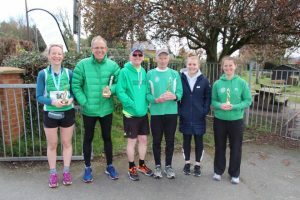 There were encouraging performances from Mark Jones, Nicola Field and Helen Jones in their final preparations for the London Marathon. Ruari Benton finished ahead of Rob Parry who is successfully continuing his mission to run a half marathon every month this year. Ruth Crowther continues her comeback to running and successfully ran her furthest distance yet finishing a very respectable time. There were plenty of Harriers enjoying the dry weather on Saturday with some good performances. 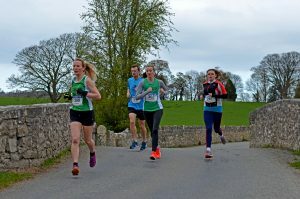 Tuesday evening saw the second in the Denbigh Harriers Noel Morris Summer Handicap series. The series is run once a month from March to October on a 3 mile cross country course on public footpaths around Denbigh. Each runner is given a start time reflecting their current running form with the faster runners starting last. When the handicapping works well the runners finish the course at more or less the same time. 27 Harriers raced this month between hail storms with Andy Morris victorious followed by Roger Snaith and Luke Hughes. On the same night two Harriers travelled to Fron near Caernarfon to compete, with 118 others, in the first race in the Tuesday Evening Fell Race Series. It was a cold evening, the ground covered in hailstones. The fast 2.8 mile race ascended 500 ft in the first mile, up a stony track, through the quarry on slippery slate to the summit of Moel Tryfan before descending quickly down steep, grassy slopes and boggy paths to the finish on top of an up-hill track. Jon Fleming finished in 27th position in a time of 21:59 and Menai Baugh finished first female over 60 in 95th position in a time of 28:49 setting a new age record for the course. On Sunday Manchester Marathon saw four a Denbigh Harriers amongst the tens of thousands taking part. First home as Shaun Hughes who slowed after. Avery good first half. Hywel gained a lot experience from his run and Lisa Dafydd was very pleased with her finishing time. New member Jack Williams also ran finishing as third Harrier on the day. 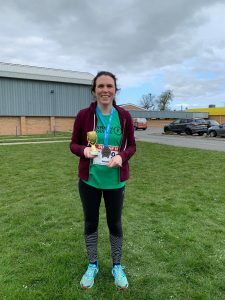 Two Harriers ran in the Border league with Emma Collins continuing to lead the F55 category with 179th place in 36:57 and narrowly took the category on the day. VIc Belshaw managed third place in a very competitive category with 96th in 32.56. Slotting in neatly between the hailstorms – brilliantly organised by Rob P and Kate – this was a much more exciting race than in March, mainly because there were more people (27) with tighter handicapping. It was cold (7C), and wet underfoot, with the long grass making it particularly energy-sapping. Despite the fact that most had run hard races at the weekend there were some remarkable times, especially in the tough conditions. Katy equalled her previous best from 2 years ago and Elen continued her series of strong performances (2 minutes quicker than last year!). Very good (sort of) to see Victoria hurtle past me, after her months of adversity. Top performance by Jon W – another PB, I think – made possible by his strength on the big hill, where once upon a time he used to crumble. Welcome to Lizzy, Luke, Peter L, and John G, who all impressed. Interesting that only Shaun got under 20 minutes (though Glen was close) which confirms that it was heavy going out there. Vic Belshaw represented Denbigh Harriers in the English Fell Championships 2019 at the Stretton Hills Fell Race. This was a very large and high class field of the best fell runners in England. Vic made the top ten in his M55 category in just over the hour. 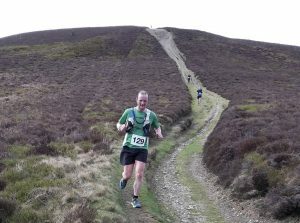 Plenty of sleet, rain and wind at times and extraordinary views of the Shropshire Hills making this a challenging race. Seven Harriers turned out for the beautiful Llantysilio Fell race on Saturday in perfect running conditions. The 10.4k ( 6.5miles) course climbed the three hills of Moel Morfydd, Moel y Gaer and Moel Gamelin and included 702m (2300’) of climbing. It was a successful morning of running with three harriers picking up prizes. Sioned Griffiths completed the Dee Valley and North Berwyn Challenge today running on the hills above Llangollen. She completed all 31 miles of the Challenge with over 5,000 ft of ascent in 6hrs 44. Another Harriers going long distances this weekend was Brett Jones who completed the Jurassic coast 3 day challenge finishing in an very impressive 4th place overall. There was a good Harriers turnout at the Vale of Clwyd 10k and 5k races. In the 10k Melina Morris stormed to first placed lady in a PB 46.41. Bob Neale finished in 50.37 just missing out on his age category. Luke Hughes finished in 51.01 representing the club for the first time. Sarah Bayliss won her age category in 55.44. In the 5k Elen Baugh was second lady in 22.57 and Ron Birch won the M70 category in 37.07. David Baugh was 3rd overall and second man in 20.33. Three Denbigh Harriers were at the Shrewsbury 10k on Sunday where they faced cold but sunny conditions which was for running on this undulating course with a slight diversion due to the flooded River Severn on an otherwise flat section. Just over 2000 runners and 3 good performances from the Harriers. Duncan Jones in 251st overall in 45.51. Ian Jones enjoyed his run in 48.58 with a a personal best and Jess Jones running well in 67.37. The Parkruns were poorly attended but two harriers braved the awful conditions. 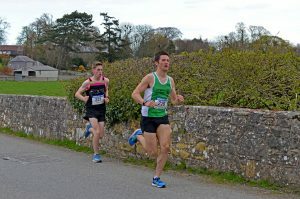 Two Denbigh Harriers ran the Loggerheads trail races on Saturday. David Spencer ran the tough 2 lap 10k race in a time of 1:13:21, finishing in 96th. Sarah Bayliss opted for the 5k and took 33:12. She was 12th overall, 4th lady and first lady V50. UK Inter Counties Cross Country took place on Saturday with regional teams representing all parts of the UK. This was a top class field and Denbigh Harrier Shaun Hughes representing North Wales was the teams’s 3rd counter. The standard was unbelievably high with runners the top runners in the UK competing for honours. Five Denbigh Harriers travelled to Dolgarrog to run the unusual Pipe Dream 4 mile fell race. The race starts in the village but ascends 1000 feet in the first mile – up hundreds of concrete steps alongside and in-between two enormous pipes carrying water from the reservoir above. It is not the prettiest of fell races ….. However, the descent is pleasant, fast and varied over a small tussocky hill, a rough, stony track, a slippery, muddy woodland, down a steep concrete track with a fast sprint along the road in the village to the finish. Tony Wood was first Harrier home in a commendable 43 minutes, followed by Emma Collins finishing in 47 minutes, Emma yet again proving she is un-beatable on the fells, as well as the roads, in her age category – not only did she take the F50 first prize but she broke the category record too. Katy Baugh was not far behind, running strongly and finishing in 50 minutes. Jon Whitehead also had a strong run finishing in 56 minutes, followed by Menai Baugh sprinting to the finish in 57 minutes and winning the F60 category. Only two local Parkruns were attended this week with notable runs from an in form Vic Belshaw 3rd overall at Bodelwyddan and Elen Baugh finishing as 1st Female for the second week in a row. 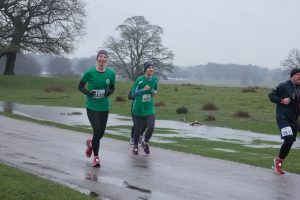 The Harriers went to run the Tatton Hall 10k in appalling conditions including hail and snow. Rhian Jones finished in 378th position in 1.01.41 and Sioned Roberts running her first 10k finished 381st in a time of 1.01.49. The Denbigh Harriers summer club handicap series started on Sunday in wet but not cold conditions. In the series all runners are set off at intervals based on their current performance which results in fast and slower runners finishing at around the same time. The 3 miles course was soggy on the lower slopes which made for an advantage for the stronger runners. 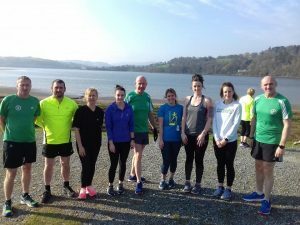 Sixteen hardy souls turned out with numbers reduced to others running in Anglesey. Congratulations to Anwen Brown for a decisive victory in what must have been her best run for some time, finishing in 27:12. Second home was Tony Wood in 19:48 with Dan Jones finishing in 19:30 and the fastest time on the day. On Sunday, 8 Harriers travelled to Anglesey to run in the Half Marathon. The route takes the runners from Menai Bridge to Beaumaris, then loops out into the countryside before returning to Menai Bridge. Conditions were cold and wet, but thankfully the race was before storm Freya hit, so not as windy as later in the day. Phil Hayes was the first Harrier across the line, in a PB time of 1:33:40. Mat Jones was second from the club, also with a PB time of 1:37:59 .Hywel Roberts followed close behind, in 1:38:53 – his London Marathon training continues well. Melina Morris was the first club lady home, in a time of 1:46:39 PB. Ian Jones was next, in 1:56:15 – this makes it seven consecutive months for a HM for Ian, starting back in September. The Border league was held in Birkenhead Park with 344 runners turning out for this 5.5 mile race (sub on my watch), in wet and chilly conditions. Vic Belshaw was 107th 35:16 and 3rd in this strong category, Emma Collins was 168th 15th Lady and 1st v55 38:50. 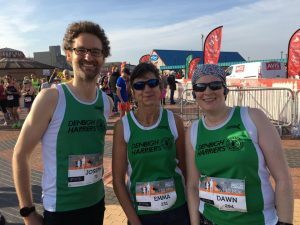 Denbigh Harriers had a glorious morning for a run on Saturday in Rhyl. Even the wind didn’t seem as bad as usual as 565 runners set off from Rhyl to race to Prestatyn and back along the seafront racing this established fast, flat 10 mile race which incorporated the North Wales 10 mile Championships. Four Harriers supported this local race with Joe Welch first home in a PB, 13th overall and 5th M35 in 61:57. 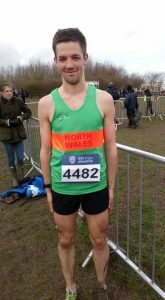 Joe took 2nd VM35 in the North Wales 10 mile Championships. Next home was Emma Collins in a fantastic 75:01 and over 13 minutes ahead of her nearest rival. Emma convincingly claimed both her VF55 category in the race and was crowned VF55 North Wales 10 mile champion. She was 13th lady and 91st overall. Ruth Crowther in this her first 10 mile race and longest race to date finished next 310th overall, 100th lady and 23rd in her VF45 category and second in the North Wales Championships in 1:32:35. Fourth Harrier home was Dawn Marshall delighted to get a PB in 1:34:52, taking over 2½ minutes off her previous best. She was also awarded bronze in the VF40 North Wales 10 mile championships. 324th overall, 110th lady and 18th VF40 in the race. The Ruthin 5k was well attended and eight Denbigh Harriers took part in the 5k and 10k. It was beautiful day for running on a good mainly flat course. In the 5K there were great personal bests for Jess Jones and Elen Baugh with Elen just missing out on third woman. David Baugh was 4th man and 1st M50 with Ian Jones supporting Jess on her run. In the 10k Shaun Hughes had a fine run to finish in second by some margin. Dan Jones achieved a great personal best as did Mari Williams. Meinir Hughes enjoyed the fine weather on this pleasant course. Three Denbigh Harriers turned out for the first race in the Welsh Fell Running Championships series. 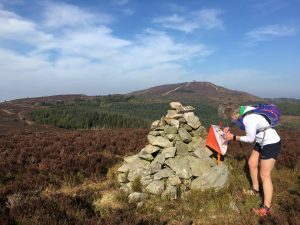 The Sheeptracks race is a challenging mountain navigation race, 18.9 miles in distance with 4,300ft of ascent on unmarked sheep tracks through the heather, bracken and gorse of the Clwydian hills. For the over 60’s there is a shortened version of the main race – a 12 and a half mile race with 3,270ft of ascent on the same unmarked route. Tony Wood ran the 18 mile race, which is closer to 19 miles, through the energy-sapping heather, gorse and bracken down steep descents and up even steeper ascents in a very decent time of 3 hrs 51 minutes and 54 seconds. Enjoying the glorious weather and running the 12 and a half mile version of the race with her daughter Katy as company, was Menai Baugh finishing strongly as first lady over 60 in a time of 3 hrs 15 minutes and 8 seconds. Unfortunately ( or fortunately) Katy’s time ( which was the same as Menai’s) didn’t count in the Over 60’s race!